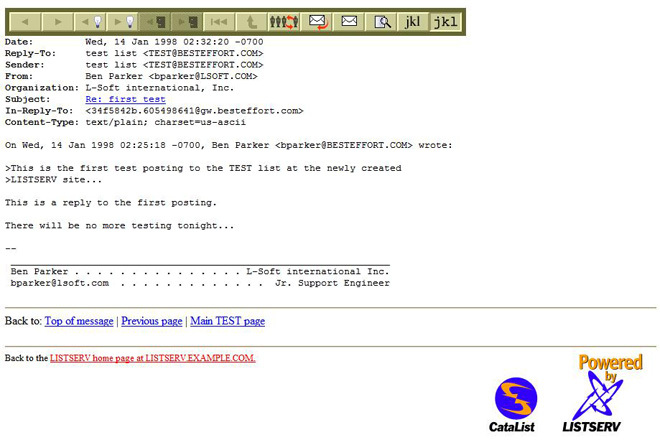 The story of LISTSERV began in June 1986 when Eric Thomas, an engineering student in Paris, developed the first software program to automate the management of email lists. Before this, all lists had to be administered manually, which was so slow and cumbersome that it threatened the viability of mailing lists altogether. The early LISTSERV lists were mostly technical or educational. In 1987, LISTSERV added the first database functions, making it possible for subscribers to search list archives for messages of interest, effectively turning LISTSERV into an electronic encyclopedia. 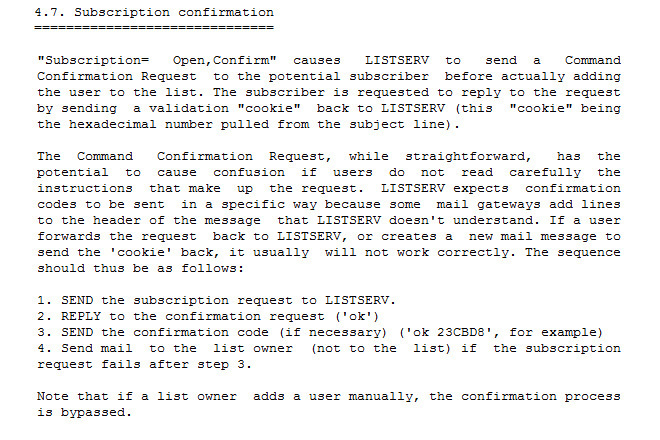 LISTSERV 1.7f was the first software to introduce double opt-in, which would become the global gold standard for permission email. Double opt-in protects subscribers by requiring them to confirm their subscriptions before being added to a mailing list. In LISTSERV 1.7f, the confirmation consisted of replying to an email with an OK command. As universities were increasingly abandoning mainframes, Eric Thomas realized that the only way to save LISTSERV was to go commercial. 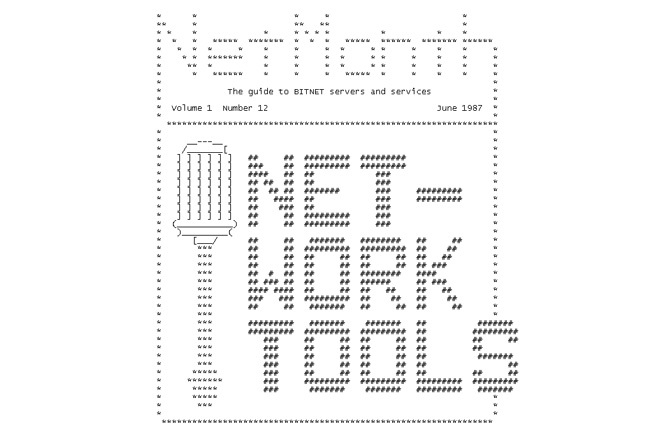 In 1994, L-Soft was incorporated and later that year, the first version of LISTSERV for Unix and VMS was released. 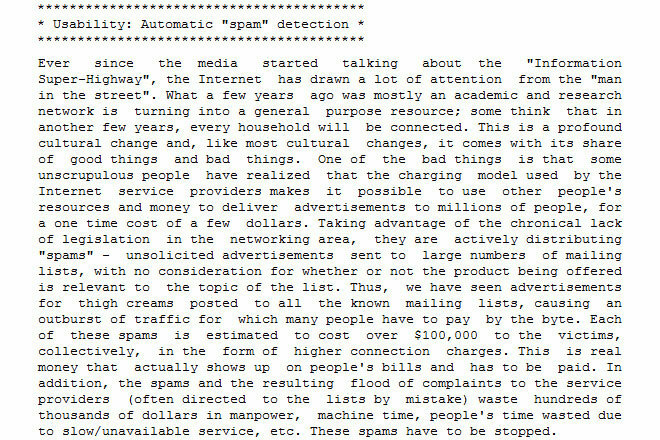 LISTSERV 1.8b introduced the first spam filter. This was not only a first for LISTSERV but for the entire industry. 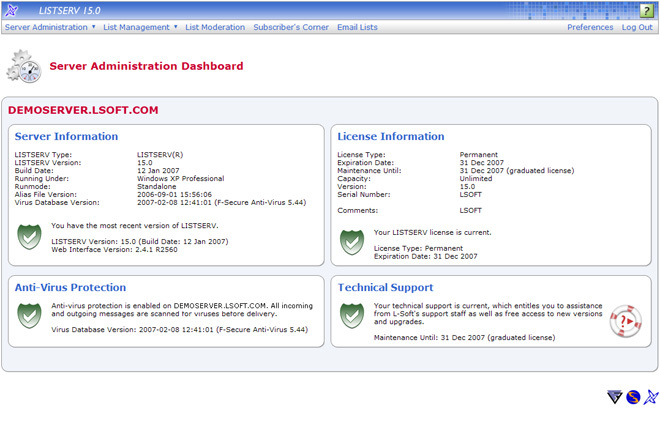 LISTSERV 1.8b was also the first version of the software available for Windows. 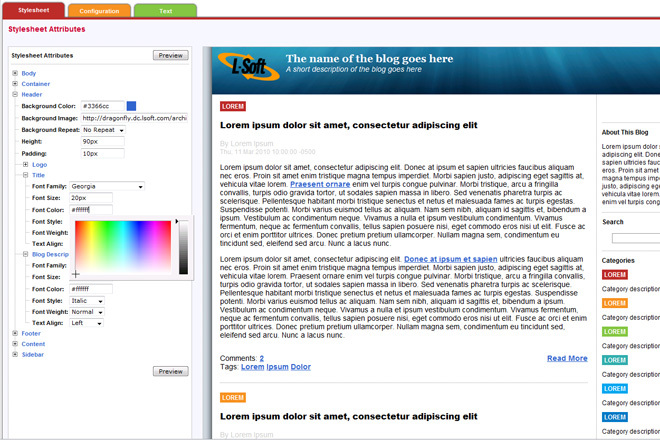 LISTSERV 1.8c introduced the first LISTSERV web interface. 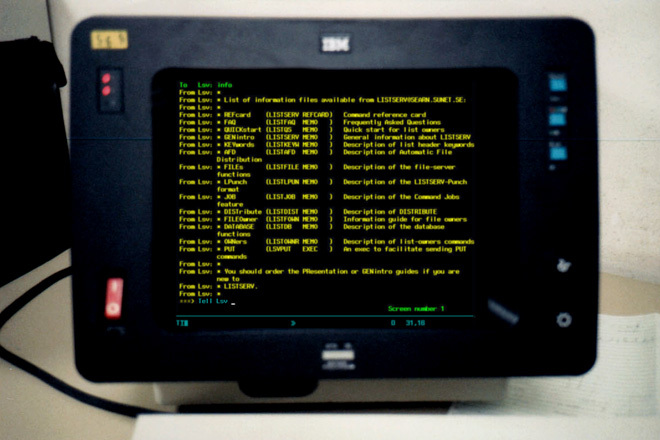 It was a simple and utilitarian interface that allowed users to browse and search list archives through a web browser rather than through email-based commands. 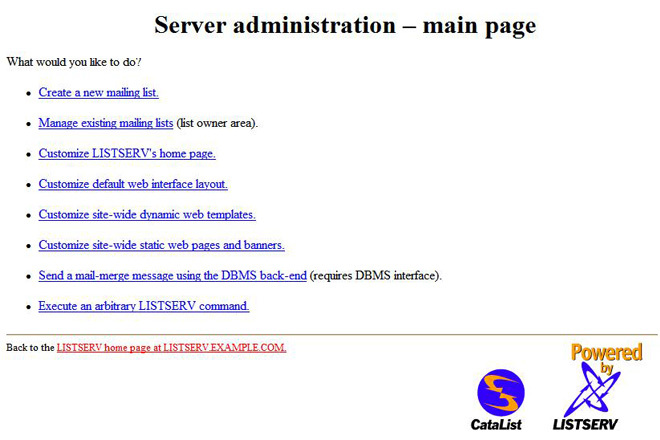 LISTSERV 1.8d improved on the first web interface by featuring password-protected list archives as well as new server administrator and list owner sections. LISTSERV 1.8d also added support for mail-merge, which allowed users to send personalized messages using a database back-end. 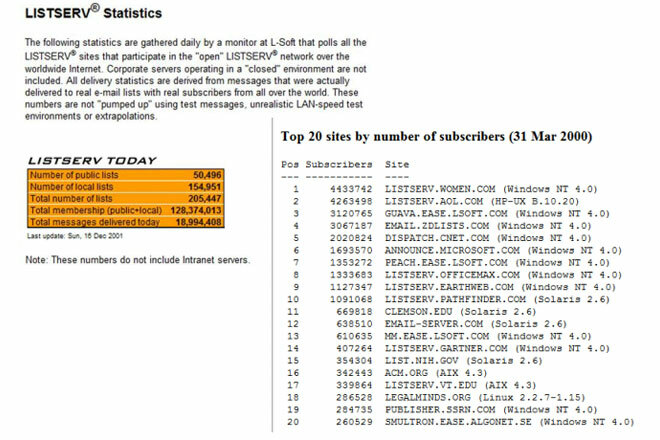 After a ten-fold increase in just three years, LISTSERV surpassed the milestone figure of 100 million list subscriptions worldwide. At the time, more than 1,500 organizations were using LISTSERV to manage their email lists. L-Soft announced a partnership with security company F-Secure to integrate F-Secure's Anti-Virus software into LISTSERV. 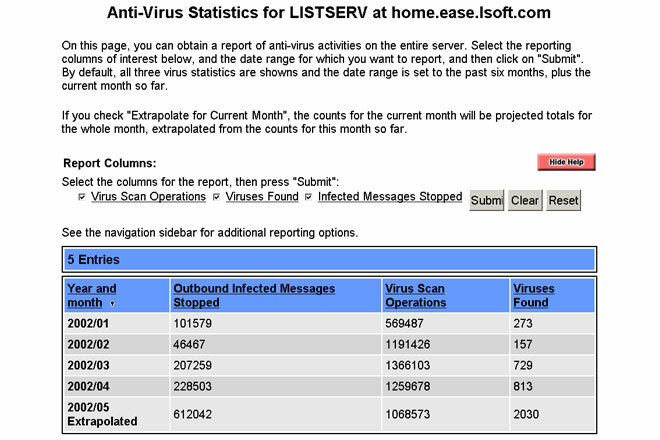 LISTSERV became the first mailing list manager to have built-in anti-virus capabilities. The system scans every message and attachment for viruses. If a virus is detected, the message is automatically rejected. 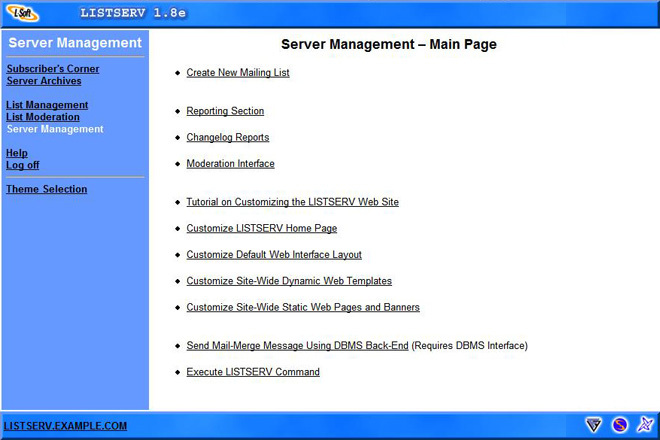 LISTSERV 1.8e was released with a brand new web interface that offered list administration wizards, allowing list owners to more easily configure and manage their lists through a browser. Web-based subscriber and list reports were also introduced for the first time. 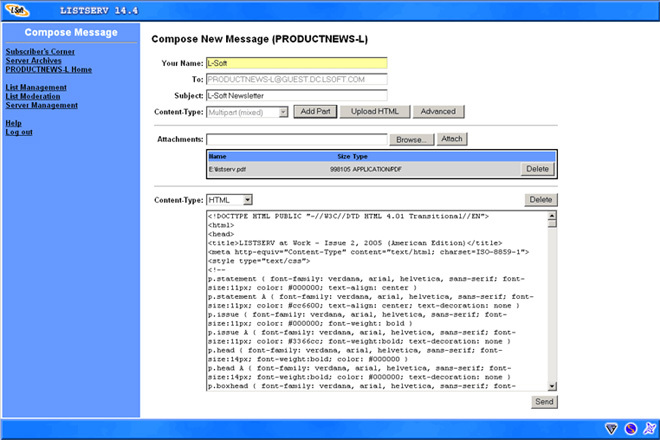 LISTSERV 14.4 featured a message posting interface with support for HTML and multi-part messages. 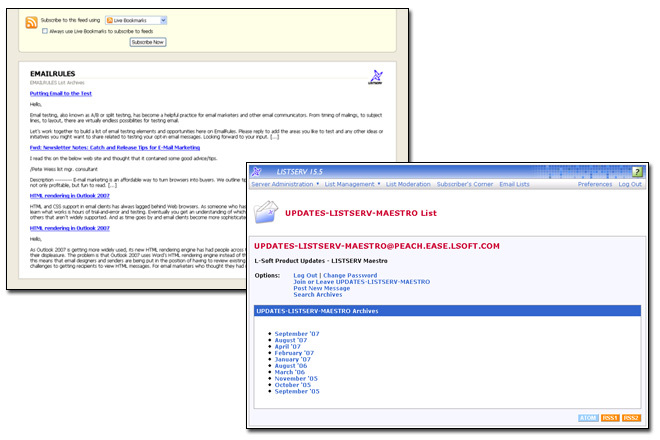 LISTSERV 14.4 was also the first version available for Mac OS X. As the spam scourge was increasingly preventing delivery of legitimate email, LISTSERV 14.5 introduced DomainKeys support and a deliverability assessment tool to analyze LISTSERV and DNS configurations, giving site administrators concrete suggestions on improving deliverability. LISTSERV 15.0 featured a completely redesigned web interface with improved usability and navigation. Server administrator and list owner dashboards provided at-a-glance hubs, while the site configuration wizard allowed site administrators to make configuration changes on the fly directly through a web browser. LISTSERV 15.5 introduced full RSS support, making public list archives accessible through any RSS reader. 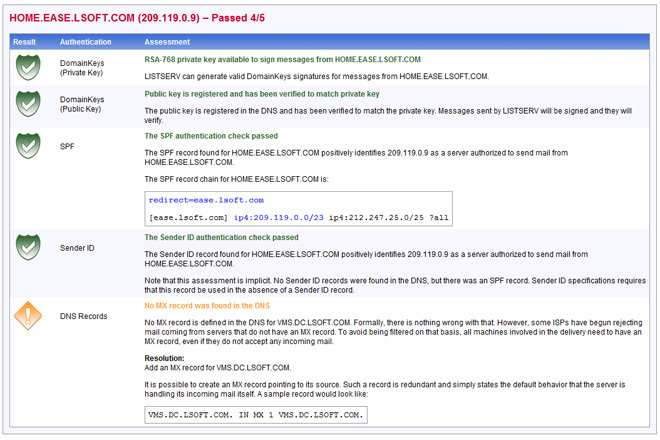 LISTSERV 15.5 also provided the capability to connect to LDAP servers to authenticate user logins, to insert LDAP attributes in mail-merge distributions and to implement dynamic queries for access control and mail delivery. 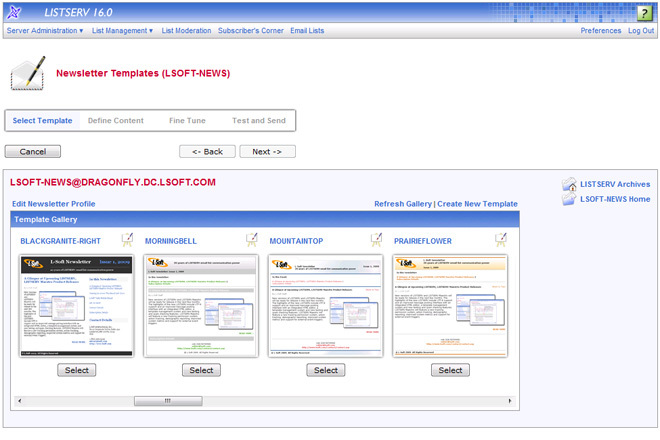 LISTSERV 16.0, released at the end of 2009, is the newest version and introduced UTF-8 support and a newsletter template gallery that allows users to create HTML newsletters by simply clicking on placeholders and filling in the content. LISTSERV 17.0, currently under development, will include several new social media integration features, subscriber profile fields, a calendar feature and the ability to present list archives in blog format. The HTML newsletter gallery will be expanded to provide an easy-to-use, point-and-click system for creating any type of custom HTML newsletter.